The unpiloted aerial vehicle is inspected upon arrival at the Dryden Flight Research Center. 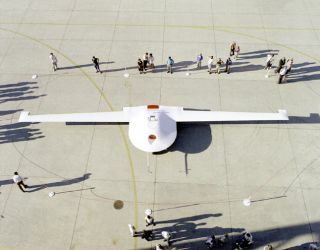 In this historical photo from the U.S. space agency, the Lockheed Martin/Boeing Tier III- (minus) unpiloted aerial vehicle is inspected by NASA personnel September 14, 1995, following its arrival at the Dryden Flight Research Center, Edwards, California. The Tier III Minus project utilized Dryden ground facilities during the flight test program. The vehicle was developed by Lockheed Martin Skunk Works and Boeing Defense and Space Group to satisfy a goal of the Defense Airborne Reconnaissance Office (DARO) to supply responsive and sustained surveillance and reconnaissance data from anywhere within enemy territory, day or night, in all types of weather. Dubbed DarkStar, it had a wing span of 69 feet and was designed to fly above 45,000 feet at subsonic speeds on missions lasting more than eight hours. The first DarkStar prototype made its first flight on March 29, 1996. At the begininning of its second flight, on April 22, 1996, it crashed on takeoff, and was destroyed. The DarkStar's unusual shape was dictated by the requirement to orbit its target conducting surveillance while still remaining stealthy. Whereas aircraft like the F-117 are designed to be more stealthy from the front, the DarkStar is designed to be more stealthy from the sides.